A Piece Of The Action: Remco Spotlight- Azrak Hamway Goodies! Item Name: Various AHI "Rack Toys"
The Rundown: Back in the 1970's, Azrak Hamway Incorporated reigned supreme as one of the "big dogs" in rack toy manufacturing. 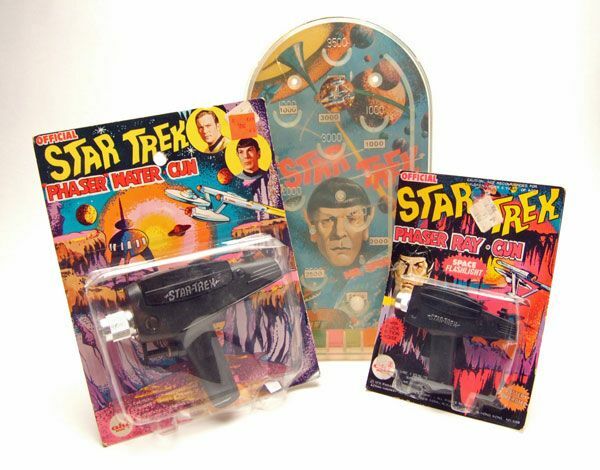 If you were in line at the grocery store with mom, and you spied a neat ray gun or ball game for sale, odds are it was a Azrak Hamway product. AHI produced a bunch of Trek-related items during the show's popularity explosion in the 70's... Today we'll take a peek at 3 of 'em! 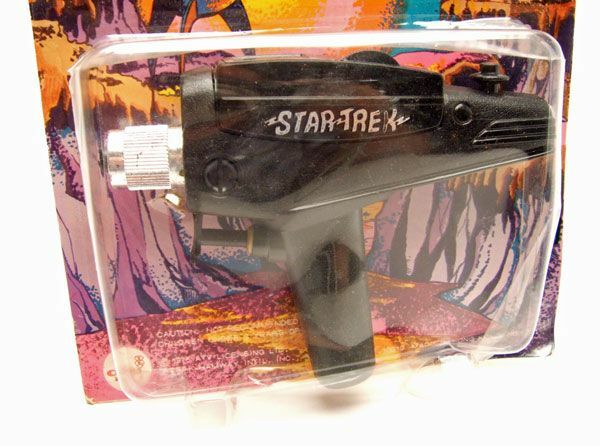 First up is the "Phaser Water Gun". What kid could have resisted that packaging!?! It looks like a Gold Key comic, and as we all know those rule. 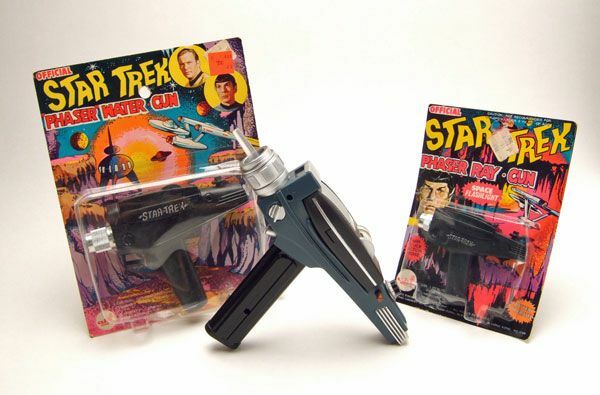 Marrying the phaser design with a squirt gun seems like a no-brainer to me. Forget super soakers; This would easily be my H20 weapon of choice. 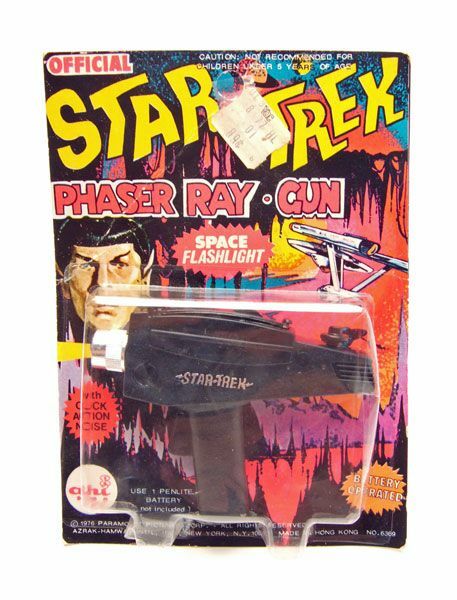 Next up is the "Phaser Ray Gun". This guy is basically a flashlight shaped like a phaser. The packaging even calls it a "Space Flashlight". You also get a CLICK ACTION NOISE, but since I don't really want to open this, you're just going to have to use your imagination on that one. Both the water gun and flashlight share the same basic body design. Look familiar? Well, it should. 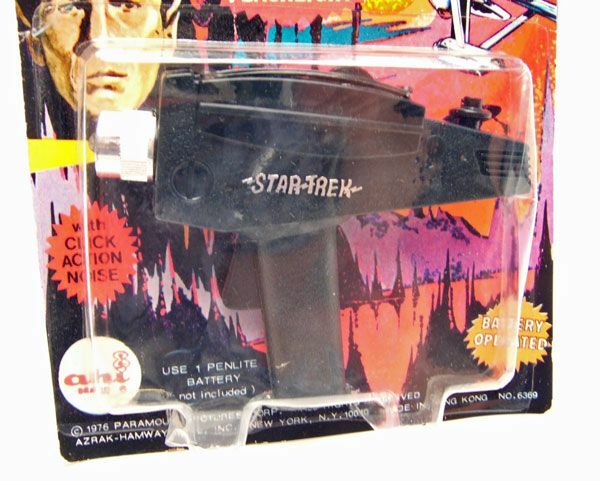 The design is very similar to Remco's phaser. That's because AHI acquired Remco back in 1974, offering these smaller, cheaper toys under the AHI brand and the nicer, more durable stuff under the Remco name. The size on this is pretty small, especially the flashlight. I threw a DST phaser toy in a pic to give you a sense of scale. They are made for little hands though so that's totally fine in my eyes. Lastly for today, there's this odd activity game. 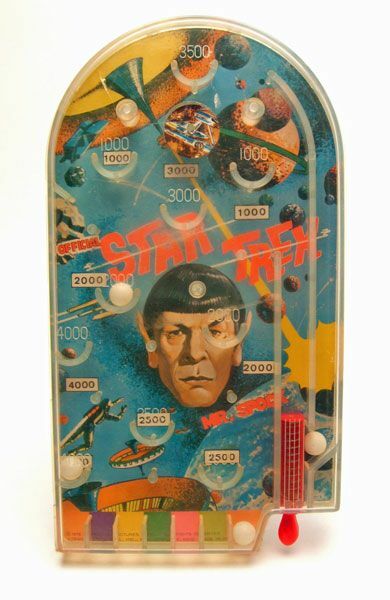 I want to call it a pinball game, but it's not. You pull back the little spring and try and shoot the white marbles into the point recesses. 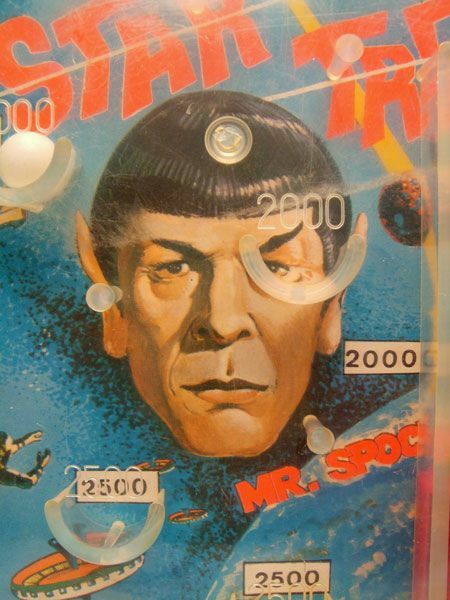 It's a game of skill and concentration that takes a Vulcan mind to master. Hours of fun! AHI produced some pretty goofy stuff over the years, from the super-neat water gun to parachuting action figures (a future spotlight candidate). Most of these items can be had on the cheap, and make for pretty cool display pieces. I'm always on the hunt for more AHI goodies, so I hope you enjoyed this AHI combo spotlight... because there's definitely more coming! OH! Almost forgot! Congrats to Miles for winning the AA/ DST Tribble giveaway! Thanks to everyone who entered! Keep an eye out for more giveaways as I always have extra Trek stuff looking for good homes! Great pics! DId you buy these new yourself when they came out or did you find them somewhere later? 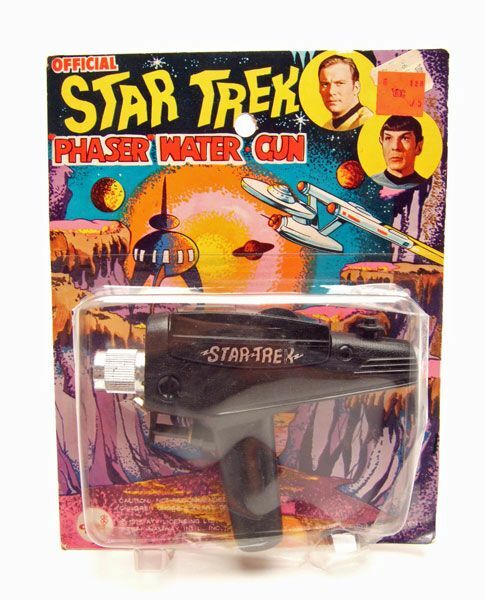 I bought the phaser water pistol, and still have it, but not in the original packaging, which I don't even remember. Thanks for posting it! I detested these toys that seemed to be at all the discount department stores in those days, junk like this and the Remco utility belt cribbed from the AMT Exploration Set. I despised that the horrible Gold Key logo and artwork inspired by that bad comic was used. There were a lot of products then (a disposable plates/cups party set comes to mind, a board game) that cribbed between the Gold Key look and the Filmation look ... it was the days of Paramount OKing any marketing deal, they were amazed that some old rerun was turning into a cash cow, so why would they care about accuracy? At this point fandom was just considered "trekkies" nobody in the mainstream took seriously anyway. When I look over at my great current-day Exploration Set on-a-budget (MR tricorder in an eBay bargain, a Vegas Experience communicator and a DST phaser), I enjoy them and lament at the same time that such things didn't exist 35 years ago, when seeing the junk at Two Guys made me pine for screen-accurate toys. Sorry for rambling, you really opened a floodgate of memories. Hmm ... I'll bet you have the popsicle molds.